– Option 2 – installation disc and tines with distribution of seeds for sowing a wide belt (belt drill seeding), providing high throughput, low driving resistance and high yields. Nowadays topper machines which cut beet tops without copying root heads via rotary topper and only after this heads are cuts individually by passive knife widely used in the world. However, with using this topping method significantly increases sugar-bearing plant material losses. Taking into account that sugar beet tops is effective raw material for receiving biogas, its collecting without loss is actual beet industry problem. However, when cutting tops from sugar beet heads with individual copying and collecting tops from each root crop head the topper productivity is significantly reduced, the design of the topping device becomes complicated, operational expenses considerably increase. Methods of mathematical modeling, programming and calculations on PC are used in the course of research. As a result of the conducted research the mathematical model of a cut without individual copying of root crop heads as well as algorithm are developed. This algorithm enables to determine the rational height of installation of the cutting device over the level of soil surface that in this turn provides minimum losses of beet tops. Dependence of sugar-bearing plant material losses and residues of beet tops on cut height without individual copying of root crops heads was experimentally defined. Comparison with theoretical calculations showed that in the range of working heights of a cut of 20-60 mm deviation does not exceed 1%. The aim of this study was to compare tillage methods and plant density on yield and yield components of soybean [Glycine max (L.) Merrill] grown under main and double cropping systems. The field experiments were carried out at the experimental area of Agricultural Faculty, Dicle University during 2013 and 2014. The experiments were conducted as split-split plot design based on randomized complete blocks with two sowing dates (normal and late) as the main plot, three tillage methods (no-tillage, reduced and conventional) as sub-plot, and three between row spacing (35, 55 and 70 cm) sub-sub plot factor. The experiments were performed in three replications and soybean cultivar Nova (MG III) was used. The combined analysis of the data showed that yield means of reduced tillage (2015.4 kg/ha) and conventional tillage (2036.1 kg ha-1 ) were significantly different (P>0.01) compared with no-tillage (1881.1 kg/ha). Significant interaction was observed. A significant part of the electrical energy used for the heating and cooling, produced from fossil based sources. The decrease of fossil based fuels and the price rises forced people turn to other energy sources. Renewable energy sources are shown as a good alternative to fossil energy sources cause of the environmental its potential. Compared to solar energy become prominent by having easy operation and lower installation costs, as one of the alternative energy sources compared with other renewable energy. Solar energy mostly used for heat water and environment. Cause of the lower solar radiation when much-needed period of habitat heating, solar power cannot be used as efficient for heating. In the summer, while the most intense and prolonged period of solar radiation there is no need for heating, instead an arising need for space cooling. In the summer, using solar power for cooling could be a significant saving method. Especially in the sun-rich regions it is possible to take advantage of solar energy for climatization plant and animal production facilities. In this study, it is aimed to explain using solar cooling systems in agricultural applications and solar cooling technologies. The contribution was to develop methods for irrigation management using knowledge in the field of precision agriculture. In the monitoring points were established basic hydrolimits: Field capacity (FC) and wilting point (WP). Irrigation rate ranged from 0 to 40 mm for a specific term assessment of soil moisture. Throughout the growing season used to be applied precisely five irrigation benefits. A high savings were observed between conventional and precise irrigation (water, energy and economic savings). The results show that it is a fully effective system of precision agriculture, although the procurement and introduction of new technology and the software requires first expending a considerable financial cost. Higher demands are placed on the skill and education services. 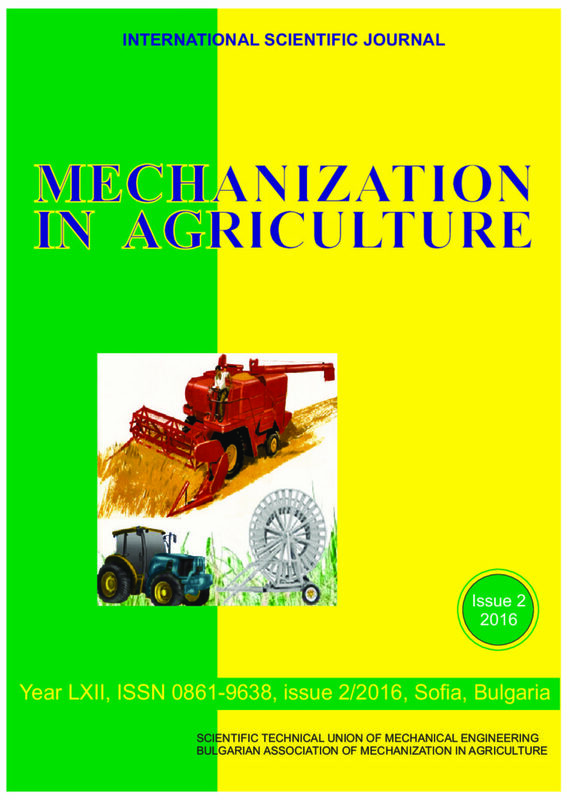 In the last decade in Republic of Macedonia and the Balkan region, the import and use of modern agricultural machines and equipment has been intensive. Some makes and models are manufactured by well known brands ,there is also imports of generic construction via a fast manufacturing process. The trend of developing and perfecting of both is a complex process, and it is rare to find an exclusive distributor. Usually the dealerships do not pay attention to servicing and overhaul or instructions on proper handling during usage. Because of the wide selection of brands that have been imported, the issues with servicing and overhaul are not resolved on state or regional level which causes problems, delays and expenses during the life span of the machines. Until now there has not been a strategy made for overhaul centers.